Pop the question with a keepsake teddy bear she can always treasure! 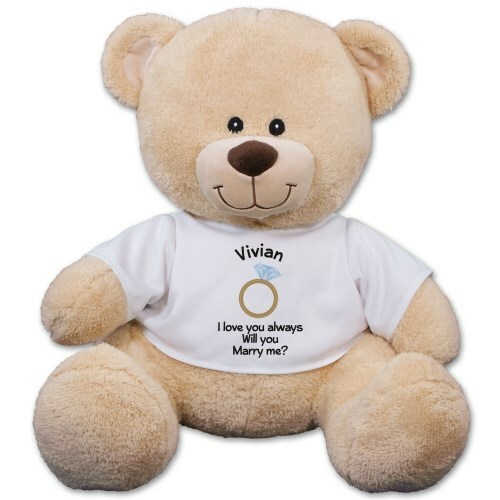 Our Personalized Will You Marry Me Teddy Bear is a wonderful way to ask your sweetheart to be your wife. Or, even your husband! Free personalization of any four line custom message is included to make this an exclusive gift idea. The design is printed on a t-shirt worn by our favorite, Sherman Teddy Bear. Sherman is available in three different sizes. Please choose from our 11 inch, 17 inch or our 21 inch teddy bear. Free Gift Wrapping and a Free Gift Card are included to create a thoughtful presentation. Additional Details Browse our entire collection of Wedding & Anniversary Plush Animals for all your gift giving occasions.